We are keeping with the PEANUTS gang theme this year and Parker is dressing up as Linus for Halloween. It wasn't really our plan or intention to go with another one of the PEANUTS pals, it just kind of came about. I wanted something cheap, simple and hopefully homemade. Plus Parker is not too keen on things being on his head or face right now so I needed something that wouldn't involve that. I bought a solid red shirt and with a pencil, ruler and black fabric marker - stripes were born. I bought a small piece of blue fleece for Linus' blanket. (Side note: Since Parker is so attached to his blanket right now, I think it is perfect and so fitting for him to be Linus this year). 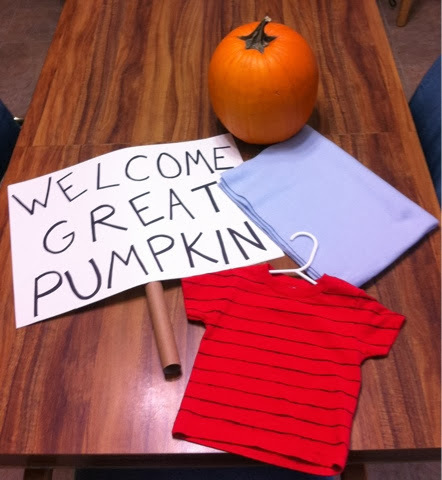 We bought a plump orange pumpkin this weekend and I made a "Welcome Great Pumpkin" sign to carry last night. We made our first trip back to Royse City last weekend - it was good to be home. We have been in Mount Vernon about three weeks and this was our first chance to head back for a quick visit. Quick it was - we left Arkansas early Saturday morning and were back by dinnertime Sunday night. It was a fast trip, but productive and fun. It was a good weekend! We had a few things we needed to take care of in town, plus we wanted to visit our new home site and also go to church. 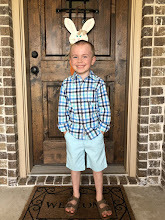 We plan to go back every few weeks to take care of any matters we need to in town, check on the house and do anything pertaining to it we need to and go to church. We love our church and sure miss it so we want to go any chance we get. While we were in town, we also drove by our old house on Mockingbird Street to see how things were looking in the neighborhood. Parker and I took a really nice walk this morning in the small town of Mount Vernon - where we are temporarily living with John's parents. It's out in the country and a nice change of pace. It was overcast and cool this morning - perfect walking weather. 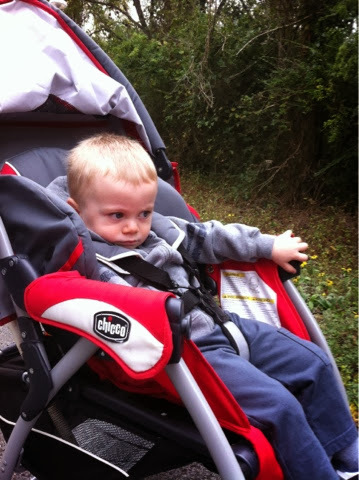 Parker loves going for a "ride ride" in his stroller and to be outside. Come along and we will share some scenes from our stroll. My adorable walking buddy. These leaves caught my eye - So pretty. I heart Fall! A shot of the beautiful scenery - not to mention the handsome fella on wheels. Down the country road we go. I had my umbrella in case rain should appear and a stick for encounters with stray dogs - luckily neither came our way. Looking down on the little man. Goats! The neighbors have several goats that Parker likes to visit and tell "Hi". They are friendly to us because we share our leftovers! An attempt at a together shot. We drove out of our drive-way on Monday afternoon, September 30th and headed east to Arkansas - two vehicles and a small U-Haul trailer. The final days in our home were quite stressful, tiring and busy. I am glad to have that part over- we are moved out! Now we are just waiting on our new home. Leaving our house was bittersweet. I am a crier so of course tears were shed. I know some of it was pure exhaustion, but it was an emotional time as well. When we bought the house on Mockingbird, John and I had been married only 3 years and this February we will celebrate 11 years of marriage - so we were there a good while. A little over seven years.